Glenfield Kitchens are a family run business, based in Glenfield, Leicester with over 30 years experience offering a bespoke kitchen, bathroom and bedroom design service and a wide range of quality products including appliances, floor and wall tiles, doors and worktops throughout Leicestershire and the surrounding areas. 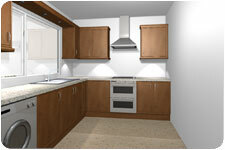 We take pride in every kitchen, bathroom and bedroom we design and fit. Our showroom in Glenfield, Leicester has a wide variety of ranges on display, along with an extensive choice of worktops, doors, and wall and floor tiles. 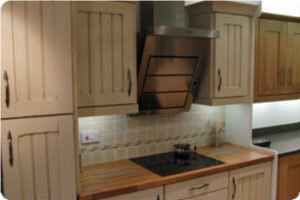 We are a company who pride ourselves on Quality, offering kitchens, bathrooms and bedrooms to the highest standard. Glenfield Kitchens are able to offer the full range of services to transform your old kitchen, bathroom, or bedroom, from planning to installation. Following a visit to our well equipped showroom a site survey is arranged when your requirements are discussed in your own home. At this stage any small building alterations can also be discussed. Shortly afterwards computer generated photo images and plans are produced to help you visualise the finished room. At this stage the plans can be revised and altered as many times as necessary to achieve the perfect layout for each individual client. At every stage of this process a detailed costing is produced and changed, as the plans are refined. Our staff will use their wealth of experience in the industry to guide and help your decisions regarding the choice of door, worktops, wall tiles and floor tiles. We also offer a large selection of built-in appliances by all major manufacturers. Your kitchen, bathroom, or bedroom will be installed by Glenfield Kitchens' own craftsmen who will be on site for the duration of the project. All plumbing and electrical work is sub-contracted to fully qualified tradesmen and supervised by our representative on site. In the shortest possible time the job is complete and Glenfield Kitchens will leave the site clean and tidy with all waste having been removed and all appliances connected and working for you to enjoy.